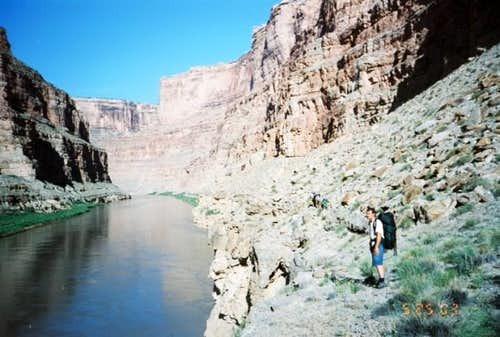 A group of six of us descended Clearwater Canyon (near Waterhole Flat) on May 24, 2003. I believe Clearwater Canyon is in the most rugged area in the Lower 48 states. Participants were Mark McCray, Ryan Cornia, Michael Kelsey, John Gilmore, Steve Brezovec, and myself. Penny Martens and Kent Beverly accompanied us to the first drop as well, and paralleled our progress along the canyon rim. We chose to descend the main fork starting near Willow Tanks. There was an Indian ruin on canyon left a little before the fist drop. 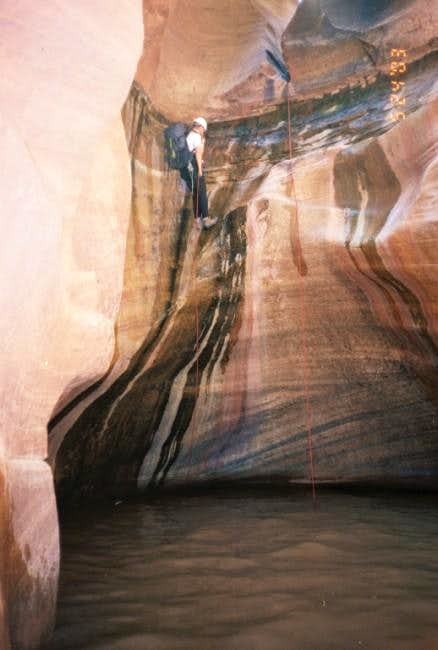 The first drop was a double drop (the second one is overhang) into a section of narrows. There were five more rappels of various lengths, but none were over 100 feet except the last one. The narrows were all short. One of the rappels had a floating disconnect into a large over our head freezing cold pool, which we had to swim through. 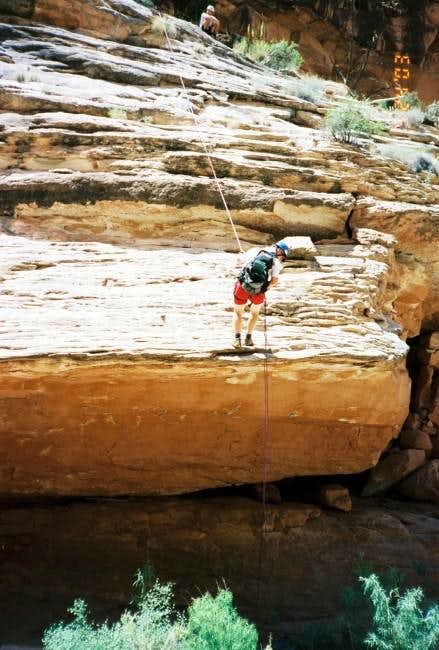 Other rappels were next to flowing waterfalls. The section of the canyon below Waterholes Canyon and the big drop was really nice with several waterfalls and huge pools. Eventually we found ourselves looking over a 322 feet high waterfall. 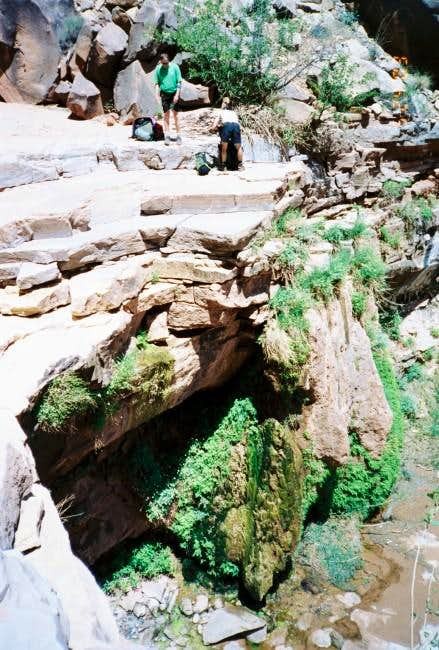 This must be one of the highest permanent (though sometimes it has a low flow) waterfalls on the Colorado Plateau. We found an anchor and really enjoyed the ride (and shower!) on the way down, landing next to a huge pool. We made our way down to some nice campsites with good water not too far from the Colorado River (or Lake Powell). This took our group of six 10 hours, but a smaller group might move faster. The next morning we boulder-hopped and walked up river to the mouth of Easter Pasture. Easter Pasture was a very steep canyon with lots of boulders and bypasses. Most falls were bypassed on the right. There were ruins on a ledge at the high drop in the upper end. There was also running water in the canyon below the ruins too. We then followed the rim, and followed the map carefully and hiked up the drainage and back to our cars. A very strenuous walk/climb! Utah is a very special and unique place. There is no where else like it on earth. Please take care of it and keep the remaining wild areas in pristine condition. The world will be a better place if you do. I'm surprised that nobody has ever responded to this amazing trip report. 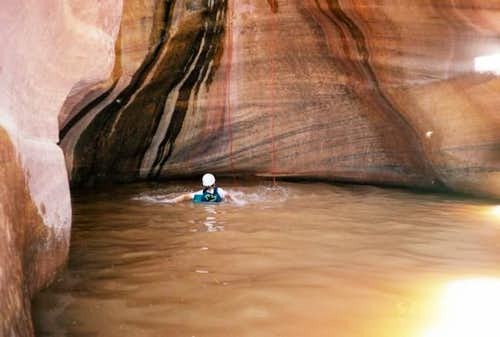 I love backpacking and I love canyoneering. This trip fascinates me!